July market stats were published by the NWMLS yesterday. Before we get into our monthly stats, here’s a quick look at their press release. 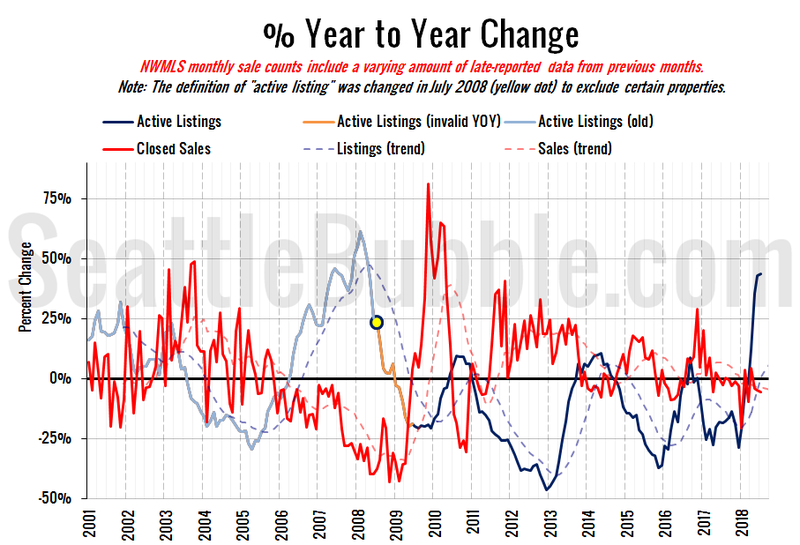 “Home sellers throughout the Seattle region are experiencing a reality check and the days of multiple offers are days of the past,” was how one director with Northwest Multiple Listing Service summarized the market upon reviewing the statistical report for July. I have no idea what “seller gridlock” is even supposed to mean. In general though, the agents quoted in this month’s press release are being fairly realistic so far. It will be interesting to see if that keeps up if the market starts to seriously slow down. The biggest news is still the climb in inventory, which is up 256 percent from the all-time low that was set back in December. If the current trend continues (a big “if”), it’s entirely possible that by the end of this year inventory will be at its highest point since 2011. Inventory rose twelve percent from June to July, and was up forty-four percent from last year. This is the largest year-over-year increase we’ve seen in active listings cine April 2008. New listings were up three percent from a year ago, but dipped slightly from June to July, which is typical for this time of year. Closed sales fell seven percent between June and July. Last year over the same period closed sales dropped six percent. Year-over-year closed sales were down six percent. Pending sales were down ten percent from June to July, and were down nine percent year-over-year. This is the steepest surge in listings that we’ve seen, with the year-over-year numbers surging faster than they did between 2005 and 2008. Year-over-year home price changes fell to their lowest level since July 2015. June or July is usually the high point for prices in a given year, but this year prices peaked in May. Between 2000 and 2017, April to July has seen the median price increase an average of 3.4 percent. This year prices fell 3.6 percent over those same four months. Based on my preference, saw 1 home below 500k. Trickle isn’t the right word. Looking forward to “trickling” in the upcoming months. It’s almost like economics works. Prices get high enough and buyers back off. I don’t think it’s that simple. I’m watching a house almost identical to one I listed and sold in the Fall of 2017 that has been on the market for over a month now. One sold earlier this year for more than the one I sold, though likely the same price per square foot. This one has more square feet than both of them with no takers even at the same price or less of the smaller ones. They didn’t bother to stage it. Big Mistake. There is another whole class of housing that had NONE on market for more than a few days for years now and today there are many to choose from. Both examples above are Redmond 98052 which I use to track the market as Bellevue and Kirkland have too many variables. Clearly sellers have to be a lot more diligent in their pricing and prep these days than has been the case for the last 4 years. In six more posts there will not be much left to say. Hmm, not saying it’s the same level of event, but the trends in ALL of the graphs for 2007 and 2008 look very similar to 2018. RE: Funkseoulbrotha @ 1 – Don’t forget that our last correction started in 2007 and did not complete itself until 2012. RE can be very sticky on the way down. Any news on the HQ2 balls front? Bigger than Seattles? It seems awfully premature to call this “on the way down”. More like very unhealthy heading a tiny amount toward sanity. We’ve had a broken market since the last correction. By broken I mean there isn’t enough inventory for someone to sell and at the same time buy something equal or better. Remember when that was the norm? Now if you sell, you pretty much have to rent or move out of the area. Please stop making fun of our beautiful spheres. They are the most innovative architectural achievement since the pyramids. Did you know they are MADE OF GLASS? That’s right. You can actually look outside from them. Before our Amazon overlords all we had to look at were some mountains and water. Do you realize how filthy those mountains are? The dirt is hardly ever swept. And the water. It is never properly skimmed or chlorinated (except of course in Tacoma where the paper mills did such a good job). i’m just here for the Haikus. The HOA suggested we do upgrades with L&I permits or you can’t sell it….a lot of money savers “do it yourselvers” are going to find out the inspectors look for permits now…their home is unsellable? They mentioned hot water heaters and furnaces installed without permits. Insurance coverage is voided likewise too. The fine toothers are getting more picky? Excellent points! I quit keeping my own record of the sales numbers back in late 2014 after having done so for almost 10 years because . . . I realized the change in individual numbers don’t show the health of the market! Our median going up the past few years hasn’t been due to a healthy market, it’s been due to a practically dysfunctional market. So sometimes the median going up means a healthy market and sometimes it means an unhealthy market. You need to look at the big picture and determine which numbers are important at the time. And in that regard, sometimes numbers become important that were not at all important before. Currently, that’s the number of new listings, and that typically hardly gets any mention. I’m actually a bit surprised that Tim has been tracking them, but in the Seattle Times article the main mention of new listings was merely that there was a “slight uptick” in new listings. For the past few years the most important number was total active listings. Before that it was the number of distressed properties. Things change. Please stop making fun of our beautiful spheres. That is undoubtedly true, and sort of fits with the idea that higher real estate taxes or condo dues will decrease value. But there’s more to it than that. After 9/11 Congress acted very quickly to protect the liability insurance industry because they realized without an insurance industry the economy would possibly collapse. Healthcare and health insurance isn’t quite as far up there in importance as the general liability insurance, but the collapse of either would send serious ripples through the economy. So what is on-topic and what is off-topic when it comes to real estate? Unemployment numbers? Wage levels? Business friendly/unfriendly government policies? The amount of student loan debt? All of it affects real estate in some way, at least real estate in the way we think of it here. We’re not here discussing paint colors, the size of bedrooms or whether a house needs a formal living room and a family room. We’re mainly here to discuss the number of sales and prices. And the healthcare system as well as the cost of healthcare are relevant to those matters, as are the other items I mentioned. There is risk the RE decline will snowball when the stock market corrects. The Fed is reducing the money supply at a rate of $600B per year. That’s a fact. Less money means lower prices on all assets, pure and simple. The only persons to capitalize on price rises of the past few years may be those who sell out in the near future. Once a market like this drops, it likely will not recover easily like last time. The Fed is out of dry powder now. Then you have demographics. Lots of people near retirement are counting on their home price gains to fund their retirement. When they see things turning, they need to sell to preserve their retirement nest egg. I see lots of those people on the East Side, mixed in with the Microsoft employees. Same with pigs and soy beans….they charge tariffs and we get cheap food that is over supplied….lower Safeway prices. Seattle real estate had become so predictable that Tim stopped posting on a regular basis because you could predict what came next. Inventory down a bit more, sales up to inventory’s constraining limit, DOM down again, multiple offers, bidding wars, prices up double digits, etc. etc. etc. The one constant is that you heard practically everyone say the same line. “This just can’t go on.” And then– finally– it didn’t. Of course, you are going to get those who see the return of 2008 around every corner telling us that this is just exactly like, well umm… 2008. Kind of predictable. And you get those other people who see it as nothing at all. Or a buying opportunity. Normally, because I am an entrepreneur and most entrepreneurs are optimists, I would generally be in this camp. I went through 2008 so I know what that looks like. I started selling off permitted and nearly permitted projects starting in the spring of 2007. I don’t think this is 2008 or anything like it. It is just because people are spooked by the prospect of another 2008 that it might be a potential buying opportunity. It strikes me that we are just getting back to a more normal market. Supply is higher than we have seen in quite a while. Demand is skittish but still pretty solid. The two meet at a relatively high price level compared to the last several years, but at a lower price level than this past spring. Stock traders know how to talk about this kind of thing. Consolidation. Finding the resistance line. Plateauing. Whacking the ceiling. Setting a topline. And just like with stocks, traders eventually (and usually almost simultaneously) start to refer to this topline as the baseline. After an undetermined period of time, the ceiling comes to be seen as the floor. How long will we be whacking the ceiling until it becomes the new floor? My guess is at least until December. But it could be longer. This is where you lose me. If our median price is a result of an unhealthy, dysfunctional market, why would it be a solid foundation for a new floor, a soft landing, or a new ‘baseline’ or whatever squishy phrase people want to use? I am expecting an over-correction, which will take years to play out. A “normal” market is lower at both ends and higher in the middle (Spring Bump) IF you are using a Calendar year. So even though we do expect the median to recede, no one knows if this is “like 2008” until we get past April-June of 2019. 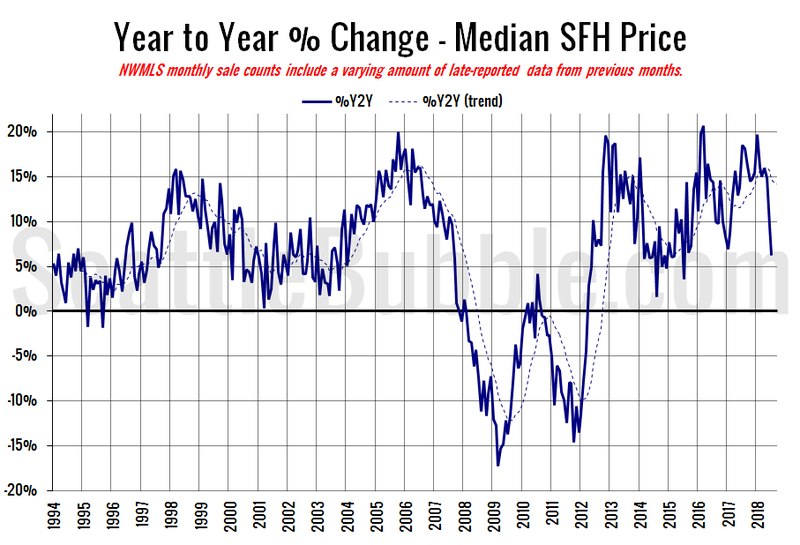 There should be a median price bump up from Fall of 2018 in Spring of 2019. But if the “bump” price is lower on a YOY basis, then that “normal” market is still in a down trend. For me, “a year” begins and ends on August 1. Real estate is a fiscal year basis and not a Calendar year basis. In the most robust upward trend years, the median continued to increase after July 15. So we already know we are in a changing market as compared to 2014 to 2017. Whether or not a person’s particular area of interest is following the trend or bucking the trend requires a more honed analysis. But generally, and pretty much nationally, very few are suggesting that we are at “business as usual” as to residential real estate. I don’t think I said it would be a solid foundation, etc. I’m just saying that the rising median wasn’t a sign of a healthy market. That you can’t look at just that one number to determine market health. To state things somewhat differently, or maybe make an entirely different point, the low inventory has been a sign of an unhealthy market. We are now getting closer to the levels of a healthy market, but some people are saying that’s the beginning of the end! That we’re headed into a decline because . . . of whatever. I think it’s too early to tell that. To use an analogy, it would be like if someone were in a coma in the hospital for a week and then woke up for an hour. Someone here might walk in and say the person is going to die because they once saw someone wake up from a coma and then die. I would consider the impact of rising bond yields on real estate, and not for mortgage rate reasons. Real estate over the past 20 years has been swamped with investors, both individual and corporate, that have been seeking better gains than low-yield bond. The attraction for these investors is that real estate is perceived as safer than stocks because the market moves slower. And if you rent the property, you get potentially a high yield dividend. This deluge of investors has made real estate very bubbly like a stock market index that goes through larger ups and downs than real estate did historically. Now that bond yields are rising again and real estate gains are slowing, investors may seek to secure their real estate gains and invest elsewhere. But for whom, you ask? Getting people away from treating housing as an “investment” would go a long way to normalizing the market. I disagree with the first part of your comment. The fed is NOT REDUCING the money supply. They are slowly reducing what they bought to fight the banking crisis. Overall, the money supply is increasing. At the same time the japanese and european (probably also the UK and china) “feds” are still running up their purchasing. It all ends up in the same big pot. This is far from plain and simple. We’ve been hearing doom/gloom predictions about baby boomer retirement for 30 years now. You should really be trying to understand why nothing ever happens. I do agree that someone with no other assets should sell that one asset into a strong market while they can. But how many really have nothing but a house? 2 percent? And if they did they wouldn’t retire, because they can’t. It was pretty obvious to some here that Tim lost interest shortly after he bought a house. He started this blog because he was a frustrated buyer. He wisely had the self control not to over extend himself when prices rose too high. Once he pulled the trigger there was no longer a need to remain hyper alert and analytical. The last few years have been super boring for anyone not in the biz. Now interest rates and inventory are ticking up slowly. It’s only worth checking in once a month until conditions change. @35 Macro: You are wrong. Other feds are starting to taper off their buying, but the Us Fed has been allowing what they bought to roll off their balance sheet and are not replacing it, which has reduced the money supply by tens of billions of dollars already. It will take a while, but it will reduce asset prices and drive up interest rates since there are fewer buyers in the market. Since one of assets they were buying was mortgage backed securities, this will directly effect the housing market eventually. Think of it this way: I print $100 and loan it to you. You go out and buy stuff. The money supply has increased by $100. You pay me back over time and once you have paid it all back, I burn the $100. The money supply has now been reduced. This is what is happening right now at the fed. The housing market is definitely normalized during recent month. If mortgage rate stay at current level and economy growth stay position, 5~7% appreciation rate for the next couple of years is still likely. One thing I noticed while new SFH start is very fewer inside city (most are re-development). Condo and apartment build up. That will take away the demand for SFH if the family formation is not picking up. I noticed many young folks stay single instead forming family. That will delay the SFH demand. Also a lot baby boomer are retiring and downsize. The shortage of retirement fund and high cost of living in Seattle will force them to sell and leave Seattle. Seattle needs a lot of young people to fill this gap. The housing trend in the next couple of years would be interesting. Although we might not see a 2008 to 2009 event repeat again , a mild market correction would be very likely. All depend on population growth and income growth. The last few years have been super boring for anyone not in the biz. I think the market activity has been super boring for everyone. Just one record low inventory after another, and record high price after another. About the only thing interesting was seeing some of the (often stupid) ways agents tried to adapt. tell me for whom the ballz toil? RE: Longtime Listener First Time Caller @ 41 – It is sort of annoying, as this is a RE blog. That being said, for those of us that actually purchase our own healthcare, it can be the #1 financial stressor. My health care for my family of two now costs me more than principal, interest, taxes, and insurance on my home. RE: Longtime Listener First Time Caller @ 41 – My health care for my family of two now costs me more than principal, interest, taxes, and insurance on my home. If that is the case, you don’t live in Seattle or you bought your house quite a long time ago. Interesting piece in the Seattle Times about where developers are building. I really wish the writer had further broken it down and looked at single family home development. Interesting that almost no development is happening in Des Moines/Federal Way/Burien, where (to me) there seems to be actual space for more housing. Wonder why that is. I was thinking about how rising property taxes can end up pushing out the very people who essentially helped to build a community—even if only passively through their taxes. One person living in an area helps to pay for improved schools/education, parks, transportation/roads, safe drinking water, police/fire services, etc via their property taxes. It’s quite a contribution over a working lifetime when you think about it! Now why is it that after folks faithfully pay their taxes, sometimes for many decades, they suddenly get ejected from their community by rising tax bills? These are people who contribute to the local economy in myriad ways through working, spending, and faithfully paying all of their taxes—sales tax too. Many of them are seniors as well. My thought is that credits should be earned for this long term support of local communities. Especially in this day and age where people seem to becoming far more transient with less “loyalty” in many regards, it would make sense to incentivize long term residency. So for example, when Bezos decides to hire a bunch of folks from say CA, they can come and participate in our “cheap” housing market, but their tax bill will reflect their newbie status while folks who have been here longer will have varying credits to offset things and help stabilize their residency through all of the changes. The newbies can then earn credits over time if they choose to stay. I had the exact same thought. It’s rather useless information when grouped together like that. RE: Kelly @ 48 – RE taxes tend to pay for ongoing programs. REET tends to pay for improvements. Real Estate prices are going down and sellers are now having a hard time selling decrepit homes for insane prices and taxes….based on my HOA snapshot the open houses are 0/140 units….NADA. The lemmings that fuel the recent price increases and sold recently were the lucky devils….IMO, its already too late to sell…just get what you can and reinvest if ya got a million dollar Seattle shack. Take a BIG price decrease and scram now. Real Estate prices are going down and sellers are now having a hard time selling decrepit homes for insane prices and taxes….based on my HOA snapshot the open houses are 0/140 units….NADA..
I’m not sure why you think the Seattle Times would be reluctant to report a change in the market. If anything they’d be likely to make up a change in the market just to grab eyeballs and sell a few more papers. But don’t confuse a lower median with lower values. There are many reasons the median can change, and what is really needed for the individual property is a comparison of the recent comps in the area. But as to this particular change in median, there may be other reasons, but one relatively new one is sellers have less of a chance of being the beneficiary of selling over-value as the result of a bidding war. Stated differently, three months ago you could have had two identical houses in the same neighborhood with one selling for $70,000 more than the other if the other was listed in a manner that generated a frenzy (or if the seller just happened to snag a buyer who was frustrated after losing out too many other times). That doesn’t mean one house was worth more than the other, but that would push the median up if there were multiple transactions bid up over value. From WSJ article of today: Price increases moderated for metro areas across the country, but affordability continued to worsen. The median existing single-family-home price rose 5.3% to hit a new record of $269,000. Two metropolitan markets—San Jose, Calif., and San Francisco—now have a median home price above $1 million. The typical home in the San Jose area now costs more than $1.4 million, while in San Francisco it costs $1.07 million. Rising home prices and interest rates are worsening affordability and damping home sales across the country. But the West, which has seen a particularly sharp run-up in prices in this six-year housing rebound, is bearing the brunt of the slowdown. “The West region has the fastest job-growing regions in the country, yet sales are coming down” because prices have risen so much, said Lawrence Yun, chief economist at the NAR. Twenty-six percent of California households could afford to purchase a home at the median price of $596,730 in the second quarter, down from 31% in the first quarter, according to a separate report released Wednesday by the California Association of Realtors. In 2012, 56% of households could afford to purchase the median-price home. Also, NAR: months of SFR supply – nationally 4.1 for June. Wow, a real estate blog where contributors actually post real estate data…novel concept on this blog. 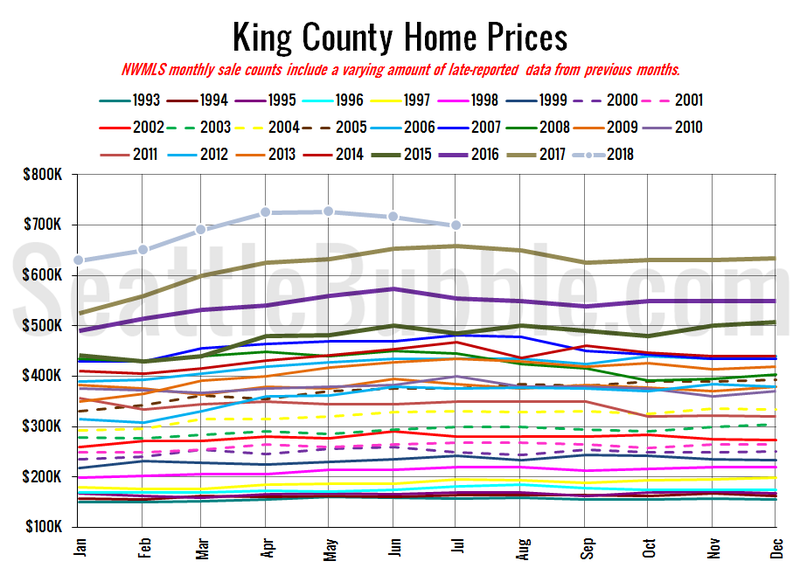 *****The TIm, why dont you introduce an affordability index for seattle or king county into your semi regular chart postings? Maybe just too far to commute. Higher density will always be better for a city. Nope. Profit margin is too thin there. Demand driven because no one wants to sit in traffic for that long every day. RE: Matt P @ 54 – Burien and Des Moines are not that far from Seattle, or even parts of the East Side (though a Redmond commute would not be appealing). People commute from Shoreline and Edmonds – by comparison, Burien and Des Moines can offer buyers a good value for a similar lifestyle. The lower demand (hence less development) in the area is actually a plus for buyers of more modest means. Seattle’s condo inventory increased 104.6% YoY in July of 2018. As someone who does the Des Moines to Redmond commute daily, let me very much confirm that it is NOT appealing if you are driving yourself :) However, no more a headache than someone doing Tacoma>Seattle or Shoreline>Redmond. And if you’re an early riser, it’s actually not bad. As to Matt’s point, the current south end of the light rail is practically in Des Moines, and not that far from Burien. As to Ardell’s point, that’s why land is cheaper there. I’d guess it’s more zoning and slope issues. It’s not just traffic of course, but a combo of traffic and area. People will commute farther from a nicer area and chose to live in a less nice area for a shorter commute, but no one wants to live in a crappy area with a longer commute if they can afford not to. But the cheaper land doesn’t help because the cost to build is not low enough to balance the land to cost ratio. The cost factor creeps too far into the profit margin. Hence my comment: “Profit Margin is too thin there”. Des Moines is not a crappy area, at least most of it. This is a terrible idea. If you incentivize “loyalty”, you also disincentivize mobility. And as it turns out, mobility is a huge way that our economy prospers. People need to move for better jobs, bigger (or smaller) housing, or many other reasons. Once you tie a financial incentive to staying put, mobility drops and you get a stagnant population with significant inequalities rather than a dynamic, vibrant city. To see this policy in action, look at Prop 13 in California. It’s almost exactly what you’re describing, and has been an unmitigated disaster. Doing the same for me lately. Maybe it was an update to the site. Using Chrome browser. Don’t worry, Amazon is going to screw downtown Seattle soon. AMZN just negotiated a huge tax incentive in Alabama. Have you heard of WA doing this recently? Not that I know of. HQ2 is clearly and methodically going to teach Seattle a lesson. Seattle is going to insist on belching in AMZN’s face once AMZN starts negotiating. That isn’t going to work. I would suggest it’s more of a cost to build factor. If you’ve followed Burien or Des Moines or the lower cost areas in general, you know that the price appreciation has been huge (especially for these areas that are relatively close to the city). The demand has been there, but to make a decent profit given high local labor rates and such, as it has been mentioned before, its mainly $900k+ builds despite the demand at lower price points. Walk the talk or stay neutral….BTW, your opinion was at least detailed and anything is possible Kary, even watering it down…its just when I make investments or pull out of investments I don’t like a MSM source that is pro-Seattle real estate suddenly changing its mind, on the front page too. Its horrifying to me and too risky. It seems to do it with all browsers–at least Chrome, Edge and IE. I’ve started using IE for SB because I have it set to allow autofill. Warning me if I didn’t call their IT number my computer would “blow up” [figuratively]….the popup gave me “5 min” to call MSFT…. I pressed the Windows button on the keyboard and soft booted out of my MSFT “froze” computer. Used it for hours [beyond 5 minutes IOWs] and it works normal as ever….LOL….they lied. I use Mozilla, but IE is still needed to support some special S/W or websites….ya learn something new everyday Kary. And yes, we all don’t know everything and “I knew that” becomes a rude/pointless comment in this constantly changing world. Never “cast your pearls before swine” [offer assistance to the smug folks IOWs]. Nuclear engineers don’t know everything too…we goof up too, we all do. RE: softwarengineer @ 71 – I’m pretty sure that wasn’t Microsoft that sent you that message. Also I think Chrome and Edge are considered the most secure browsers today, but FF may be making a comeback! BTW….have ya seen the new Mission Impossible movie? Hackers magicians are kings/queens with S/W….not engineering science or predictable math formula…random number generating is now a science? LOL….ask Houdini? Is Chrome more secure than Mozilla? It doesn’t matter, ya use the O/S that works for your websites and S/W. The housing market hit a sudden and “significant” slowdown in the past few weeks that could continue in coming months, Redfin Corp.’s chief executive said Thursday afternoon. “For the first time in years, we are getting reports from managers of some markets that home buyer demand is waning, especially in some of Redfin’s largest markets,” Kelman said, specifically calling out Seattle, Portland and San Jose as areas where inventory was still tight but did not seem to be pushing prices higher still. “We aren’t entirely sure how much of it is the market and how much of it is us because our guidance is based on a slowdown that only occurred in the last few weeks. It was a significant slowdown,” Kelman said. “It may be that we have a good week this week and a good week next week and we can outperform it. But we are seeing a significant change. All anecdotal of course, but redfin is sending me a lot more emails with 30 recommended houses than before based on the areas I searched, sometes up to 2 per day. On those lists are a lot more relistings or listings with price drops – also purely anecdotal. Redfin, after a period of waffling valuations, seems to be steadily pushing up values in the West Seattle, Burien area again. I’m curious to see if the latest housing data is the start of a new trend / something bigger or if this is just a momentary correction only to have home values continue to increase into CY19. interest rates have gone up. money is now more expensive. house prices need to adjust downward (or at least flatten) to equalize. Totally agree! Construction labor and material costs are too high to make good money in those areas. I can’t link the property because it’s an active listing, but I just saw a Redfin valuation that increased since by well over 40% in less than three months and is more than 40% over the list price of the property! That’s one of the most extreme automatic valuation errors I’ve ever seen. Plus the higher RE taxes and differing income tax treatment (real or imagined), as I mentioned in the prior thread. But I still think the biggest impact is from merely overpricing. What’s the status of their new stock offering? Was that completed? It seems like sort of an odd analysis, but I don’t know their other markets. There are only slightly fewer new listings, so the impact of that locally is minimal. But on the buyer side the impact is significant and positive. If you’re paying RE agents by the hour would you rather have them making offers on listings with more or less multiple offers? The Tablets Have Eliminated Microsoft Office S/W. Desktop and laptop computers are for creating content, while tablets are primarily for viewing content. I really doubt they have much impact on the sale of Office, other than maybe due to the general decline in PC sales (which often include an Office license) due to the (stagnant) sales of tablets. I’m not seeing a mistake-type valuation increase on Redfin. Just steady increases after suddenly going down a little, then flat – now up. I was at a block party this past month here in Greenlake. One 70+/-year old woman was crying this exact same tune. Oh, we have paid the taxes all these years. We have contributed for so long. We built this community. But now we are being forced to pay an unfair, onerous tax burden. We are being forced to have to think about moving when people like us have lived here for so long. We raised our families here and people like us are the backbone of the community. It is not fair to treat older people like this. The people who need to pay these taxes are the young people and the newcomers and the foreigners, etc. etc. I have talked to the husband before so I know the facts. This woman and her husband bought their 3000 sf Mission-style house on an 8000 sf lot when they were grad students and teaching assistants at the UW in the late 60’s. They bought it for $26,000 with a down-payment they got from their families. Their parents co-signed on the loan. They made their mortgage work by renting out the upstairs bedrooms to other grad students. They paid off their 30 year mortgage in the 90’s. Along the way, they have fixed it up and put in a swimming pool and it is valued at about $2 million. Do I think people like this deserve a break? No way. Let’s be clear about this. The baby boomer generation in this country had it really easy. They got higher education for free or cheap. They bought their houses at a very low multiple of their gross income. They are getting far more out of Social Security than they deserve. They own the bulk of the county’s assets. Millenials and GenXers come out of college with crushing debt burden and face tremendous housing costs, transportation costs, daycare costs– you name it. It is not even clear if there will be a Social Security when they get old. They have the bulk of the country’s debt. If you really want to talk about being fair, we should talk about putting a tax on the assets of Boomers to relieve the burden on younger people. Say that to someone in their 70’s and I guarantee it will be a pretty short conversation. Prop 13 is probably the reason for high prices in a lot of areas since California transplants sell off then come to other places and drive up prices there with the money they made. What absolute drivel. Because someone has more than me, he should give some of his to me? So a successful developer who is a beneficiary of a good market and lucky timing should share his wealth with an unsuccessful developer who is not? Ha, ha, I suppose this may be well done sarcasm and not imbecilic ravings. Time to tax the Boomers who became the Me Generation and then became the Helicopter Parents and are now…. the new Greedy Geezers on the block! Tax them! Yeah, of course that was sarcasm, but I can see I hit a nerve. Whenever someone comes out with a really bad public policy idea, they somehow get the old folks into the act. Rent control and Prop 13 are two good examples. Look at RDFN today. Slammed almost 25% and at historic lows due to market correction? Slow down in real estate crushes it’s market cap. Watch out below. Looks like a 5.00 stock here and then taken private. After 13+ years still never made a penny. It’s generational issue not a successful vs not issue. Boomers got houses and toys and vacations and anything else they wanted plus retirement even though they never saved. The following generations got debt to pay off that the boomers ran up. Sure, the elite tech employees, less than 1% of the population, have good jobs, but everyone else is forced to live with less. The boomers are the first generation in the US to leave the country worse off for those that follow. Plus boomers are living much longer than previous generations which is also distorting the housing market vs how it used to work and more of them live alone than previous generations. +1 that the original point was a generational issue, not a successful vs unsuccessful issue. Defensive baby boomers try to make it about that, and then go to the lengths of trying to explain that the growing income inequality and wealth gap is because they have higher IQs and are more successful than previous generation. Millenials will have their day in the sun and screw over the next generation, it’s just timing. That said, baby boomers did a lot to ensure that their day in the sun was a long and prosperous one, concentrating wealth at insane levels. They can’t take it with them when they die, but they can make the world a worse off place by hoarding it while alive which is what they are doing. I don’t blame them, they just don’t know any better. I’m 32, most people in my cohort are paying off student loans instead of a house. We could debate ad nauseam the student debt crisis, but in short, well-intentioned regulators tried to guaranteee access to student loans, which meant schools had an infinite supply of money and the demand was in elastic to any increases in price. Turns out, 18 year-olds are not great at long-term thinking and their well-intentioned teachers told them a college degree was the way forward, so they did as their seniors advised. I graduated in 2008, and at my first job in Big 4 got to watch 40% of my office laid off within two months of starting due to the recession. I’m sure it is because they are all unsuccessful whiners, right? That is as wrong as saying the slaves were slaves because they wanted to be slaves, not because they were thrust into an amoral power dynamic that was in no way of their volition. But it isn’t because Boomers as a whole were greedy wealth hoarders either, the legislators just made a couple of ill-informed policy choices that a few people systematically abused (similar to the real estate bubble) to get rich, and didn’t consider all the logical conclusions of their actions. In this case, unintentionally kneecapping an entire generation by making it too easy to get tuition loans or real estate loans, driving up prices and debt levels, and then thrusting an economic collapse on an entire generation in which wages have never recovered. In the last ten years in particular, most wealth is built based off of ownership in assets rather than wages — more than in the past even, and it is near impossible to even build enough of a nest egg to invest with today’s slave wages. Because Millenials graduated school with debt instead of assets to invest, they have been systematically cut off from the supply chain of wealth accumulation which is dependent upon compound growth on pre-existing assets. I love and respect the Boomers, despite that they made imperfect but well-intentioned policy choices. They just wanted us to get an education and buy houses, and didn’t consider the incentives they were creating for private parties (also Boomers, but a handful, not the whole lot of them) to fraudulently enrich themselves off of the dreams of 18-year old college students or first-time homeowners. I don’t really understand all the wars and resistance to science and alternative energy, that was the only thing that was really batshit insane to me, but other than that I think they had very good intentions and limited foresight as a result of humans having limited minds, and that our gov’t falls victim to common “design-by-committee” anti-patterns. Most Boomers themselves are exploited by the few mega-wealthy. That said, they could certainly afford to pay better wages now (and without the need of gov’t intervention, just because it is right) but are too primitive to understand that it would benefit them in the long-run to do so. I cannot wait for them to die because they can’t take their money with them and I look forward to using whatever exploitative means exist to concentrate as much of it as possible. That is the lesson they left for us: eat, eat, eat, mine, mine, mine, get off my lawn, f*** you, that’s mine, and so is that and that and that. He lives in the swamp lands to the north, Arlington. They get more rain and overcast there than all the surrounding areas, so it’s cheaper to live there. The current debt problems are policy issues, not generational issues. When the govt encourages college attendance and makes student debt non-dischargeable in personal bankruptcies, education costs skyrocket. The boomers paid 10% mortgage interests while millennials paid 4%. Healthcare costs were an order of magnitude lower before govt got actively involved. Labor participation rate was measurably lower today, especially among the millennials. People simply don’t connect policies and consequences/costs. They want to do/feel ‘good’ but then complain about the costs. Eg. millions of refugees in Germany. E.g. exploding healthcare costs following Obamacare (Bill Clinton). Good riddance. I’d appreciate housing market analysis from folks like yourself. Don’t be a stranger. The real insurance allows you local doctor access and real prescription coverage….cheap plans eliminate it. What’s the Friday update on invetory levels? Been looking forward to this week’s. I volunteered my bio-engineering skills to hospital research a long time ago, to reduce health care costs. I also learned that older RNs were being laid off in droves [the same time we pushed colleges to train more RNs] and replaced with foreign immigrant green cards and LPNs at cheaper rates….we are denigrating IOWs. We are not honest as a society either, when we despise our American experience and skills. I’m not really seeing any evidence of your claim that following generations paid off debt. If you had put that claim in future tense, then sure–they get to pay of the debt–or maybe kick the can down the road to another future generation. But I don’t see any evidence that following generations are any different when it comes to borrow and spend. The life span thing is more an issue with Social Security and our medical system. End of life care can be very expensive. I’m not seeing how it affects the housing system all that much because before people didn’t tend to move–they would live in the same house. Now it’s just a larger house. And who are you going to blame for generations not living together? It’s generally the younger generation that wants to be separate, although sometimes it is the older generation kicking the younger generation out of the house. I thought though kids are living longer with their parents now. RE: Paulie @ 97 – You can blame liberals for a lot of what you’re complaining about. Their attempts to help people actually hurt them. Make college more accessible? How about loans? But wait! Liberals wanted to do other things, and those other things cost money. So they couldn’t fund the universities as well, but that was okay, the students were getting loans for tuition–they would just raise tuition! But wait! Liberals wanted to do more things, and those other things cost money. So they couldn’t fund the universities as well, but that was okay, the students were getting loans for tuition–they would just raise tuition! But wait! Liberals wanted to do more things . . ..
Student loans were the worst idea ever, and they eventually made them even worse by making them non-dischargeable in bankruptcy regardless of the economic prospects of the debtor. And that they would drive up the cost of tuition was understood by virtually every economist on the planet (except Sawant), although they couldn’t have predicted the extent. Time for a look at the weekend inventory again. It is right about that week of the year where the pre-labor-day inventory goes into a slight-slide-then-dip-around-labor-day that probably also is associated with the back-to-school season for the main pool of buyers. I think the listing agents are well aware of the season, and some advise seller to wait until the week of labor day to list. This year is no different. 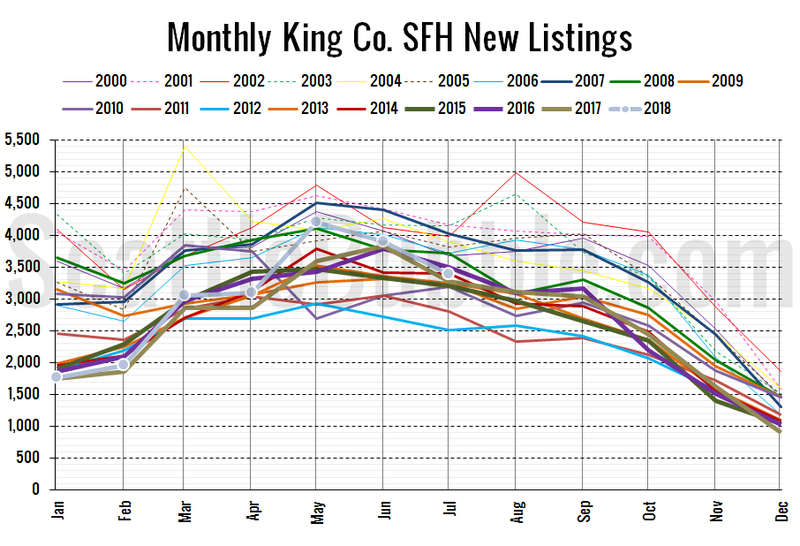 As usual, the KC/SFH inventory peaked on Friday night. The last time inventory was higher was 4yr1mo ago, same as last week. In fact the day did not change but we are 1 week further along so technically 4yr5week. I’ll try to post a 2-year plot later today so that y’all can see what I mean by my comment about the impact of school start and Labor day. It continues to be crowded at the exits. RE: Eastsider @ 98 – Ding, ding, ding! We have a winner! Makes me wonder if people deserve to hear the truth. Clearly Glenn wasn’t the first one to say the market is hitting a slowdown. But the minute he says it, his Company’s stock plummets! Since he has no duty to forecast the market, is he breaching some duty to shareholders to speak openly in a way that causes a 22% t 25% stock price drop almost instantaneously? 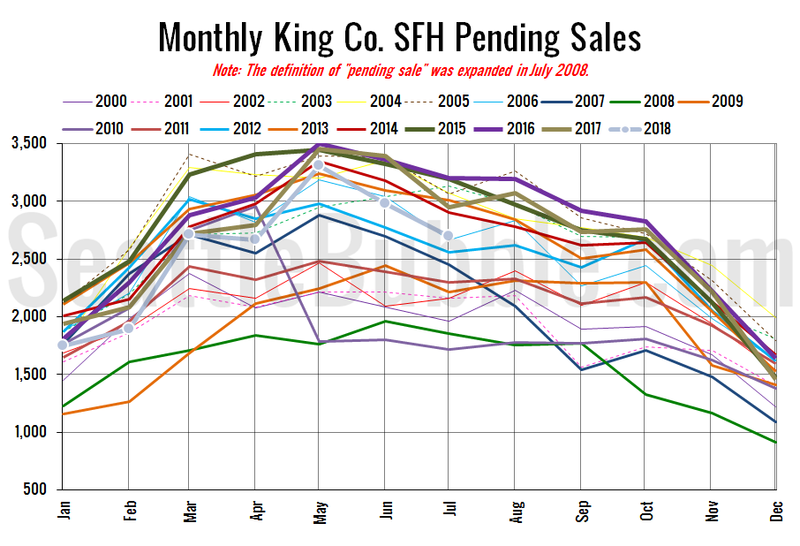 Here is the promised 2017-2018 (so far) King County SFH inventory plot based on Tim’s estately-sourced data. In 2017, the back-to-school and labor-day small-slide-then-dip is easy to see. For 2018 there is a flat this week, but it is too early to see any labor day dip. Time will tell what shape or form it might take. When I first saw the headline I thought it was some footnote in the financials. If he said that out loud I’d be surprised if there isn’t some footnote regarding changing markets. Didn’t they have a footnote about the fact they don’t have a backup site for their IT? I still have a hard time seeing how our local market change isn’t a good thing for Redfin. Before I mentioned their paying agents hourly to write offers in multiple offer situations. Even worse would be a buyer who wants to do a pre-inspection and then doesn’t get the property. Absent sales and/or prices declining significantly I’m not seeing what the downside is that he’s seeing. And if I’m right that the current situation is due to overpricing, the only downside for Redfin would be if it is the listing firm on an overpriced listing–something they can control somewhat. I am often critical of incompetent agents, but this video shows I’m not the only one. Email delivery of documents is one of the easiest things possible, but well over 50% of the agents don’t do it right! Fortunately the standard forms have been changed to allow an agent to acknowledge receipt, because absent that you can end up in legal never-never land in some situations. And as the video shows, the stupidity reaches all the way up to the level of designated broker. Last year we had a transaction where the limited service listing designated broker complained to his seller that we were sending him documents the forms clearly require be sent to him (and which NWMLS rules prevent changing). I guess you get the IQ and education you pay for. Pay off that college loan early….become a blue collar worker in Texas? Become a happy home owner…your big cost item is summer air conditioning, still Makes the King County property tax costs look huge in comparison…let alone the mortgage/rent payments with low pay. LOL, Live Span Fairy Tale Fake News? Higher IQs Are Condemned Now? “When the market is so competitive, buyers are forced into overpaying for houses. Some prospective buyers drop out of the market, Sax said, and others end up with higher mortgage payments.” – Ken Sax, president of the Spokane Association of Realtors. Ken, I thought it was impossible to overpay for a any property in Washington State. It’s certainly reasonable that agents counsel their clients to not buy but I’m not sure agents are vocal about it, publicly. “Debt to pay off”. That is future tense. Thanks for the graph. We’re still trending up when last year it had tapered by this point although only up 8 since last week suggests the taper was only a couple weeks later. “Old Geezers” are easier to track than “Chinese Non-Resident Alien Buyers”. King County has both a Senior and Disabled Person Reduction/Exemption Program and a Deferment Program. Data is more readily available for “old geezers” moving out who are on a Senior Exemption or Deferment. This for King County. The most recent 365 days is higher as to people electing to leave even though their taxes were greatly reduced, in many cases to only 10% of the total tax, likely due to the nearing of peak value. So pretty obvious that some people are choosing to “cash in” in the higher market even though their tax burden has been significantly reduced by King County. That makes more sense for those on “deferral” vs “exemption” plans. I can’t tell which, I can only see the reduced tax via Senior or Disabled benefit. Required Disclosure: Hand Calculated by ARDELL and not Published, Verified or Compiled by The Northwest Multiple Listing Service. RE: Ardell DellaLoggia @ 122 – Perhaps cost of living in this area is getting expensive on a fixed income? Car tax, tolls, utility hikes, minimum wage cost, sound transit taxes, sugar tax, homeless tax, Seattle’s income tax, healthcare premiums,… the list goes on and on. Here’s a story about problems (and delays) related to Seattle’s new building permit computer system. My favorite is the system for setting appointments doesn’t show what dates are open, so you have to click on dates to find out if there is an opening. Here’s to hoping this is the market beginning to stabilize! Buyers have had a rough go of things for a while now, it has been great for sellers but increases like we have seen over the last five years can’t keep up forever, it just isn’t sustainable. With new developments finally ready to house people and foreign invenstments slowing quickly hopefully buyers get a much-needed break. Your post is considerably more informative than the pure-propaganda of the poor-old-grandma-got-ejected type that has been filling the pages here so far. Where is your data from, is it really from MLS? MLS keeps track of existing property tax exemptions as well as owners passing away???? (I had not heard the euphemism “passing over” before, I assume that is what it means). RE: Justme @ 127 – The tax amount information does have a field to indicate it’s a discounted rate–so that would be easy to find assuming the data is properly input by the listing agent. The other would be a bit tougher–not a field that I’m aware of. There is a field for Form 17 exempt, but that could include bankruptcies, and could also include the word “estate” in the listing. As to the topic though, moving out of the area can involve more than economics. I once thought I’d be likely to move back to the Downtown/First Hill/Capitol Hill area–that it was a good area for the young and old, but not those in-between. But it’s really lost its appeal for me. Too dirty, too crowded and only God knows what its stupid politicians will try next. It’s better to be just amused by that than affected by it. So zero mention of Chinese/foreign investment pulling out. Even though we know this is a big factor in the housing bubble with multiple articles and reporting over the years, including a CNBC article in the past few days. But zero mention here. That’s… odd. When you buy a home, the listing shows the Annual Property Tax used by both you and the Lender to ascertain the monthly payment for qualifying purposes. When the tax of the seller is not indicative of what the buyer and lender can rely on, given the Senior Exemption will disappear for the incoming buyer, that is clearly indicated in one of the data fields. The tax will be reset for the buyer. In CA, the tax is always reset for the buyer based on Purchase Price, but they are one of the only States who do that outside of New Construction. The “Passing Over” is not the total number of homes sold by the Estate of X, only those that also had a Senior or Disabled Person deferment or Reduction/Exemption. I used a double overlay. To Kary, I used “Estate” in the Owner Name field search and not the Marketing or Agent Remarks search, as many agents use the word “Estate” to describe a significant home on a large property. Totally different meaning. Of course subject to lack of Agent Error, but then so is price and close date and every other data field. So at least as accurate as pretty much any data available. Often Boomers move to where their children and grandchildren live when they retire, without regard to needing to move for financial reasons. They leave once they are finished working here to go be wherever their family members are working to be near the grandchildren. Of course not all Elderly and Disabled people qualify for an Exemption or Deferment and those that meet the requirements do not qualify for the same amount of reduction. It is also income dependent. The details are in the King County link in my original email. The Data is only for the Elderly and Disabled who applied for and received Property Tax relief of some kind and I think any one who is considering a move because they are not able to pay their taxes, per Kelly’s original concern, would be able to apply for this relief vs selling their house. There are many cases when people complain about “needing” to sell due to Tax Increases, but usually that is a complaint more than a true “need”. Most recently I heard this of a man whose house happens to have upwards of 18 acres on Mercer Island. Yes, his taxes are high and he is extremely old (almost 100). He has the means to pay the tax, and even if he didn’t he could easily spare a building lot or more of his many acres to pay the tax for the rest of his life or even get a Reverse Mortgage to pay the taxes for the rest of his life. Being “old” and having paid taxes for “many decades” as Kelly said, does not equate to never having to pay taxes again. She seems to think there should be an upper limit to total paid in one’s lifetime. But that doesn’t make sense to me if someone has a Property they bought for $80,000 that is now worth well over a Million dollars. Eastsider 124: They can easily do a Reverse Mortgage against that equity to pay the tax without having to sell and many do this not only for money to pay their tax, but also to supplement their fixed income on a monthly basis. The key to this is sufficient equity and also being old enough at the time you start doing this to be sure you don’t run out of equity before you die. I’m never around when people are making the decision to do this, but sometimes when I sell an Estate Sale property, there is a Reverse Mortgage involved in the payoff at closing. Worked well in the instances where I have seen it. Not appropriate for all situations, of course. But used appropriately it would solve the issues of someone with a house that they bought and paid for many years ago and who are now too old to work and need to pull some of their equity as extra income. But they should continue to work for as long as possible and not try to retire early on their equity or it is more likely to run out while they still need it. Reverse mortgages are a terrible idea. And taxes really are a form of theft. Case in point, the transit taxes that tax the hell out of people on the one item they cannot do without – shelter. If this is not true, then why not tax the hell out of doughnuts? Transit taxes favor a small group of people who can reach trains. Trains put into places where mostly high net-worth people can reach high paying jobs downtown. Taxing the poorer people and everyone outside of transit’s effective area t support something 95% of us cannot use. Not the way the world works. That’s like the people who no longer want to contribute to the schools after their children are grown or who never have children. Only Private School is dependent on only the people who use them and public transportation is never only fully supported by fares. Historically public transportation is needed for people who can’t afford cars and parking, not to accommodate “high net worth” people. As to Reverse Mortgages, yes I agree they are often misused. But I have seen them work very well at times. Not something people should do unless they completely understand them and their situation readily applies to their purpose. But to say NEVER a good thing, well, I’ve seen them work well. When the alternative is to sell and they want to stay in their house, which is the topic of this discussion, it’s one of the tools that can help people do that in their old age. Again…stay on topic. People do NOT need to sell because they bought a house decades ago, they now own it free and clear, but they can’t afford to pay the taxes increase caused by significant appreciation. You may say they are better off selling than taking a Reverse Mortgage, and that’s a valid opinion. But then what is your answer to their staying vs leaving when they can’t afford to pay the taxes? Burien has been mentioned in this thread. Have fun looking at the boarded-up version of the below flipper on google streetview. That version sold for 294k Jul 2007, hitting the bubble peak with amazing precision. Not sure how the flip did no get recorded in the property history, but maybe it is a self-flip? Any thoughts on that from the insider experts? Also: Gotta love the video with the noisy incoming airplane in view overhead. We need more sly reports like that. He missed the shot of HW99 nearby, though. Or at least some audio of the nice freeway din would have been great. EVERYONE is a child. Almost no one is a train user. Therefore it makes no sense to compare this to schools. A politician’s excuses for taking your money are only limited to the ability of their imagination. The rest of us cannot do that because the market tells us we’re full of sh!t. Once the government eventually tells the truth that existing taxes cannot support the failing revenues of the bus-train (light rail), then they will want to raise taxes again. Probably start cutting bus services to areas that actually need the service. I’ve not been on LINK in 3-4 years even though I drive right by it. It makes no sense to use it. Even in NYC, people tried to avoid using the Subway if they could – including in Manhattan. Real homes real transactions and they have been buying and selling homes since before the US was even a twinkle in great Britains eye..
You are missing my point. Tax burden has been creeping up over the decades. King county sales tax is now almost a quarter higher than Spokane county. Why should people (reverse) mortgage their homes to satisfy insatiable demand by local/activist government? How much of our tax money is wasted and/or used to pay for needs/services that don’t benefit residents/voters? If King county were a country, do you suggest that its residents migrate to a more ‘affordable’ country? Leaving a country is not an option for Koreans or Taiwanese. These countries have become prosperous over a generation or two yet they are still ‘affordable’ to their residents. Methinks they have better budget discipline than the activists running KC. RE: Justme @ 135 – A near 20% drop from $600k to $484,950! In stock market terminology, it is called bear market. – fixed it for you. LOL. RE: David @ 133 – Transit benefits those of us who drive in the form of less traffic. RE: Justme @ 135 – A near 20% drop from $600k to $484,950! In stock market terminology, it is called bear market.. Except those aren’t sales prices–neither one is actually. In the stock market that would be called an open order. As to the article quoted originally, just another example of poor reporting. Only someone ignorant would think it was worthy to report a reduction in list asking price, but that’s our press. Here are some more tales of Apartementus Interruptus and Condominium Coitus. Apparently, that supposedly big bad Washington condo defect law is not enough to keep developers from jumping out of the frying pan into the fire. And by the fire I do not mean just the condo defect law, but will likely be a very, shall we say, uh, COMPETITIVE condo market soon. But in rapidly growing Seattle, developers are increasingly deciding these projects are worth the risk—over this summer alone, condos scheduled to deliver in Seattle before 2020 have jumped from about five to at least nine. I never said people should leave. In fact I am the one proposing solutions so that they can stay. If someone’s property quadrupled since they paid it off, causing their taxes to be higher, then there is no reason why that same appreciation can’t be dipped into by 1% each year to pay those taxes. The problem of too much appreciation is also the main basis for the solution. It’s likely better to sell and go someplace else, as the value can go down after they dip into it to pay for the increased taxes. Then they are screwed. I saw one recently where the deferred maintenance ate up all of their appreciation. The place had big rotting holes in it visible from the outside. They should have sold before it got that bad. But for people who just don’t want to go anywhere and can’t afford to stay and don’t have an income to qualify for a Home Equity Loan, reduced or deferred taxes and/or a Reverse Mortgage is likely the answer. If someone is old but owns a Two Million Dollar house free and clear, do you want to consider them a “charity case” and pay their taxes with your tax or charitable dollars? Probably not. If someone has a Two Million Dollar asset, they have to solve their own problems caused by the Two Million Dollar asset, no matter how old or “poor” they are. They have to use that asset to somehow solve the problem, either by dipping into the equity or selling and and going elsewhere. Only around the areas where the trains run. Does not much at all around everywhere else. Again, just benefitting the few % who take transit. FYI, I was on a delayed plane waiting for that guy who stole the plane to land at Seatac on Friday. Gotta hand it to the guy, he could fly a plane!! Mad skills! He should have tried to land – that would have been great. A local hero for sure if he had flown it into some local crazy politician’s house. Also, if they would simply charge the people who ride the trains the actual cost to operate it, I’d be all for all the trains people want. It might cost you $8-$10 per trip, but that is in-line with the cost to operate a car – so welcome to reality. Leave the rest of us out of it. Just curious, is anyone ready to call this real estate market the beginning of a continued slide in home prices? I’m assuming there isn’t enough evidence yet to make that call but I was wondering if there were any folks out there that were super confident otherwise. RE: Justme @ 143 – In other words their claim that the law was keeping condos from being developed was just industry BS designed to get more favorable laws enacted in their favor, as I’ve always claimed. Now they apparently decided that wasn’t working and that there isn’t enough apartment work to hold them over. It’s also being extended further north to Northgate. So basically for commuting into Seattle everywhere but into Puget Sound. I agree with that. Builders/developers were just posturing. Never let a good crisis go to waste, as they say. >>Transit benefits those of us who drive, in the form of less traffic. Also agree with that. David should note that many people eventually need to pass through freeways and other bottlenecks that benefit from transit, even when one’s particular nbhd does not itself have transit. None of the above should be construed as me advocating transit stupidity. For example, I still don’t agree with the 2017 (?) tear-up-old-tracks thing on the Eastside, though. Sheer stupidity and waste. I think the median price from now through early 2019 will continue to decline but Part of 2nd and 3rd quarter of next year will be higher than the highest of this year or at least even. After that it’s hard to say. If there’s a continued decline with no reprieve during a Spring Bump, it will happen in 2020 ad not 2019. But until then the dip could create enough panic to cause most any outcome. At present people are just being stupid. They are coming on too late in the season and pricing higher than the most recent bid up from Spring Bump. this is causing the median to drop because not only are not getting the match of the bid up price, they are getting lower than the previous asking price. Just stupid strategy. I’ve been checking the individual price reductions, of which there are many. $630,000 bid up to $715,000 in June. They price their same house at $750,000 because they think they will get more than the peak price of this year and they end up price reducing down to $690,000 with still no takers. Saw another that was $950,000 bid up to $1,100,000 at peak in May-June. New one comes on at $1,200,000 and is now quickly reducing below the $1,100,000 bid up price. Some of it is believing their own lies. “Fully Remodeled Kitchen” prices at the fully remodeled price, but they just painted the 80’s cabinets white and slapped some white quartz on top. They might have gotten away with that even into August last year, but this is not the year to play games. If this stupid continues, the median will get dragged down further than it should and Spring Bump of next year should have no trouble beating 4th quarter median. This if early next year uses August to year end comps vs stale ones. I’m saying that it is not worth the $30k in taxes they are charging people for the privilege of a train they have to work so hard to convince is worth it. It isn’t. That $30k invsted would be worth how much to the people who should have been able to keep it. Compounded out to ~$65k in lost opportunity? This is money someone’s family should have had – not the privileged few and their cronies. Stop making up numbers, David. There is no $30k in taxes. According to the website, the median adult will pay $169/year for Sound Transit 3. The median adult would have to live 177 more years to pay your libertarian tax-hater fantasy amount. There must be some libertarian math going on here. Show your calculations next time. How was the typical annual cost calculated? Here’s how the $169 per typical adult breaks down. The calculations for all three of the proposed new taxes use median values, or the amounts at which 50 percent of people would pay more and 50 percent would pay less. Motor vehicle excise tax: A typical adult would pay $43 more annually based on the $5,333 median value of vehicles in the Sound Transit District. MVET taxes are determined by a state of Washington depreciation schedule for a specific vehicle’s model and production year. Property tax: The typical adult would pay $47 more based on the median $360,658 assessed value for homes in the Sound Transit District. For renters, this conservatively assumes $47 as the median cost passed on by a landlord. Sales tax: An adult at the median income level would pay an additional $79 per year in sales and use taxes if ST3 were passed. This is based on a median household income level of $73,359 according to 2015 data from the Washington State Office of Financial Management (OFM) for Snohomish, King and Pierce counties. You’re joking right? Everyone rides the subway in Manhattan because it’s the most convenient way to get around. Almost 6 million people a day ride it. Can you imagine the chaos if there was no subway? A lot of people would move away because they simply would never be able to get to work in a reasonable amount of time. The problem with a lot of cities is adding public transportation after the fact when a city is completely car dominated. Everyone who drives and refuses to use public trans whines about how it inconveniences them even though it is really helping them. Seattle traffic is bad, but it’s still far better than LA. It will make some winners along the route and property values will spike nearby, but its still a benefit for everyone. I can’t agree with you more there Deerhawke. The baby boomer generation hade every advantage to be successful. RE: Justme @ 155 – You are wrong. David is correct. ST3 alone costs $54b. ST2 is $18b. ST1 is $4b. That’s $76b for KC population of just over 2m people. $76b / 2m = $36k per person. I can’t believe ‘educated’ people falling for propaganda put out by these activists/cronies. Both of you are wrong. The condo law certainly deters development. Primarily due to the law’s exorbitant costs. We have a drought of new condos in the area for over a decade. RE: Ardell DellaLoggia @ 153 – Thanks Ardell. Sounds like this should just be a temporary dip. I forgot to add, from the little economics I do know, I’ve heard it said that the stock market leads the economy by ~6 months. I would presume any sustained decrease in home prices would begin with a stock market correction >15%. Why do you characterize this as a “dip” rather than mean reversion? I didn’t say it wouldn’t be a deterrent. But the industry propaganda was completely over the top, pointing to a 100% chance of a lawsuit if you built a condo. The way to avoid being sued is to monitor your employees and subcontractors and not build defective buildings. It’s not like HOA’s are going to start suing over nothing. Unfortunately our press isn’t really equipped to cover these types of stories because they are too complicated. Look at the coverage above over a house’s price having been reduced, or more on-point the largely one-sided coverage of the McDonald’s spilled coffee lawsuit. RE: Matt P @ 156 – It is NOT a benefit for everyone or even most everyone, or even generally everyone. It is a blood sucking tax that benefits about 1-2% of Seattle. They carved out the taxable area knowing they’d have enough votes in Seattle to authorize stealing from all the rest of the taxed area who have no benefit. Personally, I don’t intend to play along with the Ed Murray voting Seattle public ( a kind of specialized uber-redneck class that even Southerners can make fun of), as I am moving out of their reach in the next few months. But I will feel sorry for the level-headed ones who are unduly affected by the Uber-Reds in Seattle. They don’t want open border rich elites’ destroying their economy with low cost foreign slave labor. RE: David @ 162 – Good riddance. Also, do look up the property tax structure… almost everything is spent on schools on mine – police, fire, roads, transit are almost a rounding error. Well, we have no kids and never will – why should I pay for everybody else’s? If we spend all this school money on transit we could replace every public school with a light rail station, to ensure it serves everyone. And if you want to have kids, let your beloved free market solve it for you, not me. 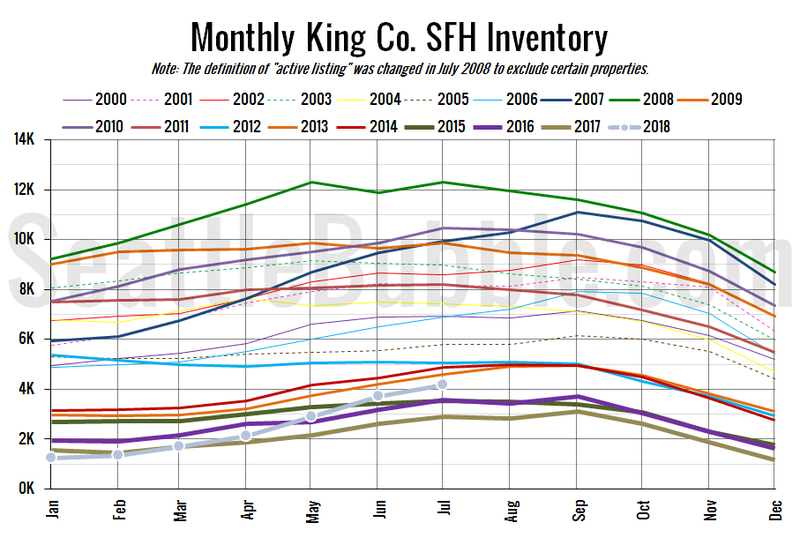 Not sure if you know this, but The Tim posts charts every month of King County SFH inventory. And there is more data than just the last year and a half. It is quite helpful for getting perspective. If you scroll up, you can see an example at the top of the page. Just thought I’d lob in a data-point, a few VC funds & Investment Research companies I follow (Wolfe Research, Clarus, Vertex Ventures etc.) started publishing bearish positions in the housing sector back in May & June. Again, maybe more ‘reactive’ than ‘proactive’ but there it is. RE: softwarengineer @ 164 – How nice that you’re going full Nazi and now calling your opponents “vermin.” Shows just what you really are. Your sarcasm isn’t working on me. The plot I posted has 1-hour resolution rather than 1-month resolution. High resolution is very useful for seeing many interesting aspects of the listing market, such as holiday slumps and back-to-school slowdowns, which may otherwise be mistaken for trends. You can also see the details of the difference between one year and the next by having high resolution and looking at only two years. But uwp knew that, he just isn’t liking what he sees. “I stand in solidarity with my fellow millennials hoping to buy homes” –uwp. What’s that smell? Oh, uwp is talking out his ***** again. With solidarity like that, who would want solidarity? Well, I for one, love your graph. I hope you will commit to publishing it on a monthly basis. This site went from the prices are too damned high and going up to the prices are falling and can’t be stopped – in about a minute. Alaska Airlines is horrified that SEATAC employees can just waltz right in and take it for a test run/crash….security is clueless…it only goes to show; terrorist can use trucks, hatchets, chemical Bombs from Home Depot, toxic Russian poisons, etc, etc…..who needs just guns??? Train derailments and torched wild fires also come to mind…a million ways to peel the terrorism onion. How about that [legal???] terrorist ISIS camp in New Mexico training ’em to shoot school children….simply horrifying. I just purchased sound transit pass. I have paid enough to support ST. Why not use it? Yes but in San Francisco inventory across all price ranges in July, declined (did not increase) by 14 percent per the report. Contra Costa County saw inventory drop by 5 percent from July 2017. The city by the bay keeps fighting the trend. According to the State of WA Office of Financial Mgt., the official population annual growth (CAGR) from 2010-2018 for King county:1.6%; seattle:2.3% and from 2014-2018 for king county:2.1%; seattle:3.3%. According to same source median household income annual growth (CAGR) from 2010-2017 for King county: 3.5% and from 2014-2017 for king county:5.3%. The Tim, you could be providing such info in your regular charts so we can better gauge the sustainability of home price increases. If you can’t read it there, you might try the article in the Seattle Times. The thing that got me was the use of the word “campus”. They are no longer at the stage where they are opening a recruiting office. They are no longer just hiring a few developers to gain a toehold in the area. Campus. One of the reasons that the supply of houses is increasing in King County, in my opinion, is due to the slowdown in rent increases. A number of the people I know who bought houses in Seattle in the last 5 years were, in a sense, unwilling buyers pushed to buy due to repeated significant increases in rent. Once couple was getting their rent raised by their landlord $100 every month after their one year lease expired. They were not looking to buy, but needed to get out of the situation and wanted to avoid being in this situation in the future. So they ended up buying a house. Another family I know was getting rent increases of $300-400 every year, which was not sustainable for them. They got some help from their parents and bought a house. I don’t know that they would have done so if the rent increases would not have pushed them to do so. So we have this situation where all of these new apartments are being built in Seattle, and based on the numbers, this has served to reduce the rate at which rent is increasing in Seattle. With lower increases in rent, this may mean that fewer people are feeling the push to buy a house. When you think about it, many of the crazy things we saw in the past five years (pre- or waived inspections, bidding wars, escalation clauses) are actions that are taken by people in desperate situations. Many of these desperate situations may have been caused by people subject to significant rent increases if they stayed where they were. One number that I would love to know is a breakdown of the average rents for various types of houses, specifically for apartments versus single family homes. The new construction of many apartments has served to stagnate or even decrease the average rent for apartments in the city. I don’t know how this has affected the rents for single family homes. RupertD and everyone else that has not heard this before. Heck, why not remind everyone: The OIF data is next to useless in estimating population except in the census years, which is the decennial years (2000, 2010, 2020, you get the idea). I have pasted below my usual missive on the OIF FIB (Filled-if-built) data, using a newly and more fun acronym FIB. So forget about those bubbly-looking population growth numbers. They are false and wrong. Exactly how wrong is uncertain. Some ideas can be gleaned from all those articles about empty new apartment highrises in Seattle, and even in this very thread comments referring to articles about the coming onslaught of condo conversions. There is one very important point about the WA OIF population data that you need to be aware of: The OIF change in population is estimated by taking the change in Housing Units (essentially new construction minus condemnations) and assuming that the average occupancy (persons) per unit is the same as at the last 10-year census. I’m going to start using the acronym “FIB” (Filled-If-Built) from now on, since it is a good pun. The methodology is rife with error, because there is no certainty that newly built housing units will have the same occupancy rate as existing ones, or even be occupied at all! Here is a reference to a recent post of mine, that in turn has links to older references that debunks the OIF FIB methodology for population estimation. It should be said that OIF itself *is* aware of the weakness of the FIB methodology, but many if not most people who use or quote the data seem blissfully and/or intentionally unaware of the very significant source of error. The recent reports of 75% vacancies in new buildings in central Seattle should serve as as an indicator that OIF population estimates are significantly above the true population number. Good thing SLU will diversify away from Amazon, since it’s going to be a ghost-town next year when HQ2 empties Seattle. But seriously, good news for Seattle. From the article it sounds like Google is tripling their Seattle workforce, adding ~6k more to the current 3k. Same is Seattle city limit. Very few SFHs are being built and many are condo and apartment. I know there are young singles but once they need to form a family, they have to move further. Condo and apt seems over built. Why do they have to? Plenty of families have been raised in apartments/condos in cities all over the world. Justme is just a little incensed because our statistical housing demand rates are built by assuming occupancy/vacancy is constant to the prior census year (2010). He goes to great lengths to rebuild the recent population estimate, but without really coming up with information useful except for “debunking” purposes. You would think a more practical methodology might be to look at those census year numbers to see how they do compare. If we were to look at the for-sale market, we can look at the Seattle Bubble inventory charts. There we can see that at any given time during 2010 there were 7500 to 10,500 houses available for purchase. That is, in rough terms, a little more than double what we’re seeing this year – and that’s about half the housing market. By the way, remember all the comments about empty houses and foreclosures in 2010? Here’s a little thing on Seattle rental vacancies that is floating ’round the interwebs. It’s not new, but it was picked for its 2010 data. It tells us that the rental portion is a little bigger part of the total market now, but we’re basically in the hunt for about 40% of the housing market. It says that rental vacancy rate back in 2010 were 5.58%. Wasn’t there something in the news or even on this site lately about rental vacancies hitting 6%? I’ll be the first to agree we don’t exactly know what the population is; however, I think anyone who has tried to traverse the streets or highways in 2010, and then again recently will agree that the population is not less now than it was. Therefore, if the owner-occupied market is clearly stronger, and the rentals are just a little less than being the same, the error in the vacancy rate assumption would be pretty small, and perhaps favor underestimating the population increase, rather than the other way round. Not saying it’s God’s truth; it’s just the probability. JustMe, never look a gift horse in the mouth. Also, in statistics, don’t focus on the small number of newly built; you have to look at the larger number of all that is built. Apartments: Women don’t want to live on the first floor for safety concerns, and living on the second or third (4th, 5th, 6th,…) means you cannot walk out into the yard. If you do walk out, down the stairs and into the grass, you have to check your shoes for the high-density doggie doo and urine. Condos: Well you paid for air space and all the joys of deferred maintenance. You bought it just in time to replace the roof and elevators! Your financial security handed over to a vote – by the board. PARODY ALERT: Any similarity with @ 193 and others is far from just coincidental. 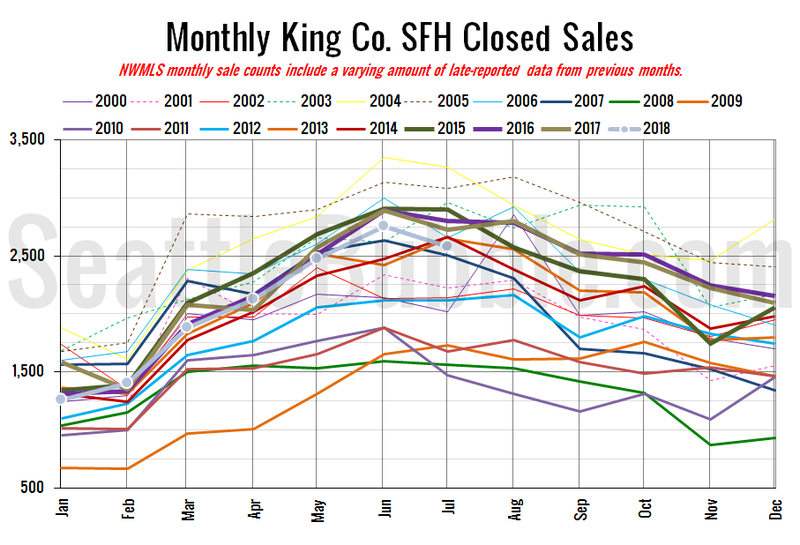 Hey, look at those high SFH listing inventory numbers in 2010, 2 years after the last bubble burst! The listing inventory is still over 2x the 2018 listing inventory is right now. Clearly that means that 2018 OIF population estimates are accurate, and population is increasing fast, as it has been for years. I mean, what better way to validate population estimates than by pointing to listing inventory? The connection is obvious, is it not? Everyone knows that. SO, this clearly means population has grown greatly and continues to do so, as of 2018. So maybe we don’t need those OIF FIB numbers, but okay, maybe we need them anyway, just to be safe, and of course they are accurate! Never mind the fact that OIF FIB numbers are based on the assumption that average occupancy (persons per housing unit) in non-census years is the same as the one actually counted in census years. All those new apartments and townhouses and whatnot are FILLED, at the same level of occupancy as a different housing stock was in 2010. Hey, just look at those 2010 Census numbers. Occupancy rate X and vacancy 5.6%! And look at this shiny 6% vacancy number I’m holding up in my hand here, right over my magician’s tophat. I haven’t told you the source of the number, but look how shiny it is! Also, I have not established whether this number is for the so-called STABILIZED subset of apartments, or alternatively whether it includes units and vacancies in the NEW CONSTRUCTION apartments. “Stabilized” apartments is a concept we use to suppress the fact that there are many empty new apartments, and to avoid counting them when we calculate vacancy numbers. These empty apartments are just temporarily embarrassed. We don’t want anyone to be embarrassed. It just makes everyone feel bad and not want to buy or rent anything at the high prices we want. For sure those empty apartments will fill up with new people emerging from somewhere. Just look at those population estimates! They are based on those empty apartments being filled already! If at the very moment of reading the preceding sentence, you are thinking, “wait a minute”, and you get a slight feeling of having gone in a circle, or something strangely circular going on, or a snake eating its tail, just ignore that feeling. The important thing here is to get with the program. Everyone knows that. I mean, who wants to count unoccupied new apartments? That just makes everything look bad, so let’s not do that. In conclusion: Everything is awesome, there is no need to sell, but if you want to sell, it is always a good time to sell. Or buy. Or rent. Everyone knows that. Just, please, please do not lower the price even if nobody wants the product at the current price. That’s just un-American. Don’t be a filthy commie with your needles and sidewalks. So just keep coming, great huddled masses. Seattle needs you to fulfill our estimated destiny, even if belatedly, and to fill our uncounted vacancies. I alone have discovered the errors in the census. Clearly everyone else that puts it together has no idea what they are doing. They are trying to trick us with their clever counting ways. Don’t fall for it! Buy my tin-foil hats that will protect you from the FIBs. RE: BacktoBasics @ 191 – Because the Seattle City Limits are highly unlikely to be expanded outward, and all the land that can be built upon is already built upon. The only way to add a significant number of housing units inside Seattle is to remove existing structures and replace them with higher-density housing. So long as the City of Seattle continues to grow, single-family homes are fated to be an ever-decreasing fraction of the city’s housing supply. It’s simple geometry. The August numbers are looking like a doozy. Monthly supply will be around 2.2, up from 1.6 in July. house investors probably want to sell for profit soon, hard to sell at absolutely top. you don’t want to hold on to many inventories when it goes down either.